The oratory belonged to the Confraternita di Santa Maria della Misericordia, which was also known as the Confraternita degli Impiccati (of the hanged) because its members took it upon themselves to comfort those condemned to die. This confraternity, which was formed in 1428, originally met in the church of San Giovanni Decollato. 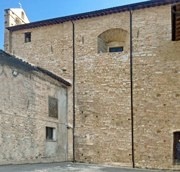 The church was finally demolished in 1869: this house in Via San Giovanni Battista, beside the Topino, stands on the site. This detached fresco, in which angels crown a standing figure of the Virgin, is now in the Pinacoteca Civica. This fresco forms the backdrop to an earlier wooden crucifix in a tabernacle (which originally had closing doors) from the church. It seems to be linked to the sale of land in 1463 by two members of the Confraternita della Misericordia in order to finance such a work from Pietro di Giovanni Mazzaforte. It is attributed on stylistic grounds to Mazzaforte’s then pupil, Nicolò di Liberatore, l' Alunno. The confraternity took the tabernacle with them in 1569 when they moved to the Oratorio della Misericordia (see below). It was moved to the sacristy of the Duomo in 1904 and is now in the Museo Diocesano. It is now in the Museo Archeologico, Palazzo Trinci. The confraternity moved to the Oratorio della Misericordia in what became Via della Misericordia in 1569, using premises that had originally belonged to the Confraternita di San Francesco. The date at which the construction of the present oratory began is unknown: a series of payments for its construction are recorded in the period 1649-58. The altar was built in 1660-6 under the supervision of Giovanni Battista Michelini (see below) and gilded in 1680. In 1643, the Arte dei Ferrari (ironworkers’ guild) erected an altar (the 2nd on the right) in the oratory. In the following year, they installed this altarpiece on it. It depicts the Madonna and Child with their patron saint, and is attributed to Giovanni Battista Michelini. This altarpiece on the 1st altar on the left, which depicts the Immaculate Virgin and SS Rose of Lima and Angela Merici, is attributed to Gaetano Sortini. 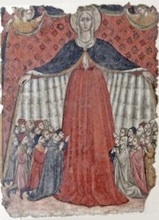 This fresco high on the altar wall is attributed to Mariano Piervittori. This altarpiece from the high altar, which is attributed to Giovanni Battista Michelini, is now in Palazzo Vescovile. Return to Walk I (San Giovanni Decollato). Return to Walk II (Oratorio della Misericordia).